More space hardware arrived yesterday. It was a functioning Motorola i425 phone with GPS. I spent part of Saturday morning programming the new phone. This phone is mighty old by cell phone standards so there is a bit of a backwards learning curve for me. 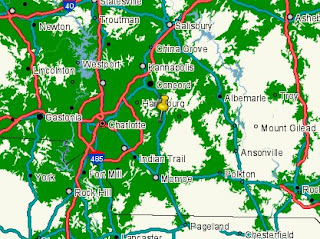 To make matters more difficult I am not in the coverage area for Boost Mobile. In fact coverage is going to be an issue for where I launch this thing. If I launch west today, say in Clover, SC, the darn thing floats 47 miles east. Here is the data I got back from a proposed launch this morning. 35.13 degrees north, 81.19 degrees west, 211 meters. 35.19 degrees north, 80.70 degrees west, 18288 meters. 24.6 nautical miles, 86 degrees magnetic from the initial position. The magnetic declination is -6 degrees. 35.08 degrees north, 80.56 degrees west, 30000 meters. 31.2 nautical miles, 100 degrees magnetic from the initial position. 35.25 degrees north, 80.25 degrees west, 211 meters. 46.7 nautical miles, 87 degrees magnetic from the initial position. When I compare this to the coverage map, I get a bit queasy. I may have to calculate a Lincolnton, NC launch. There is still lots of stuff to do and plenty of time.